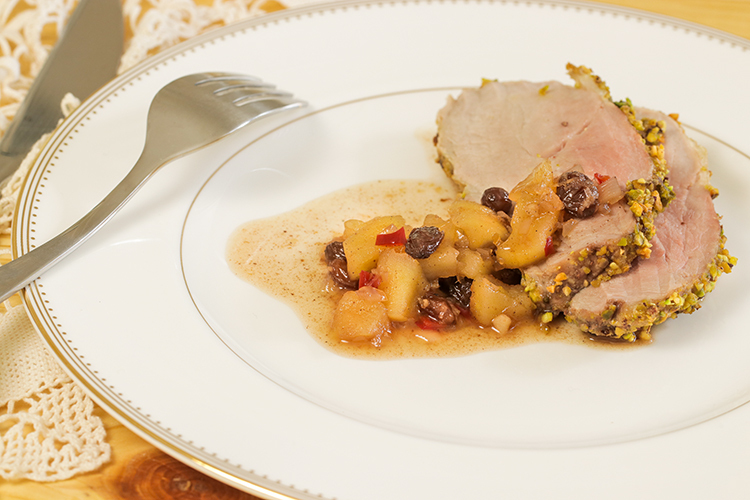 Dress up a pork loin roast with a crust of pistachios, adding more texture and flavor. Slow cook the roast to release and enjoy its juicy mild flavors. If you’re feeding a small or large group of people on a limited budget, the pork lion roast is a perfect choice. It’s less expensive than a pork tenderloin and pork chops. Cut the roast into thin or thick steak-size slices, serve with a delicious fruit topping, and add your favorite side dishes. 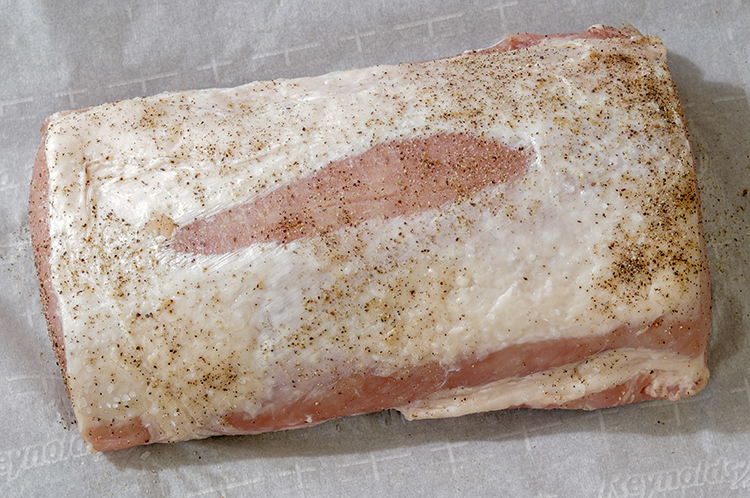 Pork loin is cut from center back area of a hog and can be purchased bone-in or boneless. It’s thicker and larger than the pork tenderloin which is cut from the back rear. Pork loin roast is slow cooked in the oven or on a grill versus the pork tenderloin which is quickly cooked. However, both cuts will be dry if overcooked. Pork loin is less expensive than a pork tenderloin. Also important to note is that it’s okay for cooked pork loin roast with a little pink in it. Learn more about this roast in Everything About Pork Loin Roast on The Kitchn.com. The roast is also called a center-cut pork loin. For my Pistachio-Crusted Pork Loin Roast, I started with a three-pound cut. At room temperature, I salted and peppered it all sides. Brush on a mustard mixture and set aside. Four ounces of shelled pistachios are ground to a coarse texture. The pork loin roast is then rolled on all sides in the coarse pistachios and slowly cooked in the oven. Tools: Aluminum foil-lined sheet pan. A food processor to crush the pistachios. If you do not have a food processor, place the pistachios between sheets of parchment paper, and pound it to a coarse texture. Heavily salt and pepper the pork roast on all sides. Then set aside. Mix the honey mustard, the ginger and garlic. Spread the honey mustard mixture on all sides of the pork roast. Lay the roast on the foil with the fat side up. Spread the remaining pistachios over the top fatty side of the roast. Using your hands, press the pistachios into the roast on the top, sides and ends. Place the roast on the middle rack of the oven. Bake for 10 minutes. Turn temperature down to 350 degrees F. Bake for about 20 minutes until interior temperatures reach 145 degree to 150 degrees F. Note: If you do not have a convection oven, half way through baking, turn the pan around to ensure even cooking. Remove from oven when done and allow to rest for at least 5 minutes.